Wities will lead the SupaBarbarians team to Uganda. Three Wits rugby players have been selected to join the SupaBarbarians touring team that is heading to Entebbe, Uganda, at the end of April. SupaBarbarians is an invitational team of players selected from all over the country. 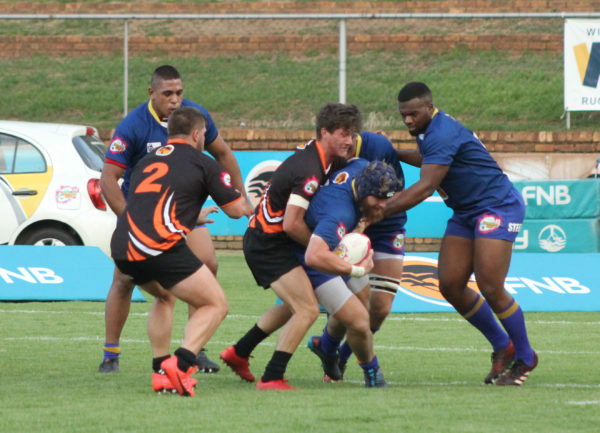 Current captain of the FNB Wits rugby team, Constant Beckerling, has been chosen to captain the SupaBarbarians touring side as they head to Uganda for the first time. He is joined by Wits lock, Conor Brockschmit, and winger, Daniel Kasende. Beckerling, a third-year BSc chemical engineering student, said that he was pleasantly surprised to be chosen as captain. He told Wits Vuvuzela that he was excited about the experience as well as having the opportunity to lead a new team. “It seems like a really exciting tour and to have a few other Witsies included is incredible,” he added. Brockschmidt, a third-year psychology student, will act as Beckerling’s understudy for the tour so that if Beckerling is unable to play, Brockschmidt will assume the captain position. He said that his hard work had been noticed and he was thrilled about the selection. “It feels great to be chosen for the team because it’s an achievement as it shows that the hard work has paid off. “My hope for the tour is to experience Uganda and enjoy the country as well as get two wins against their national side,” Brockschmit added. The SupaBarbarians matches are set for April 28 and 30 in a festival that will be televised in Uganda. Wits Vuvuzela, Maties destroy NWU to win Varsity Cup, April 17, 2018. Wits Vuvuzela, Curtain closes on Wits’ historic varsity cup season, April 4, 2018. Wits Vuvuzela, Wits defeated on home turf in Varsity Cup derby, March 13, 2018.